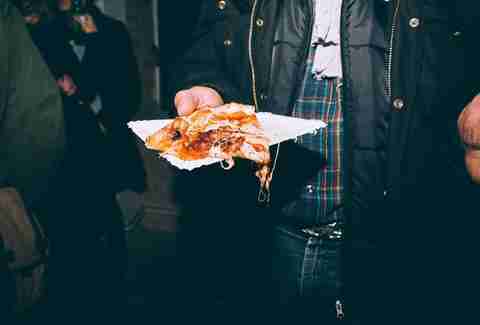 Pizza: they say that even when it's bad, it's still pretty good, but in Berlin, up until a few short years ago... it actually was pretty bad. Not today though! 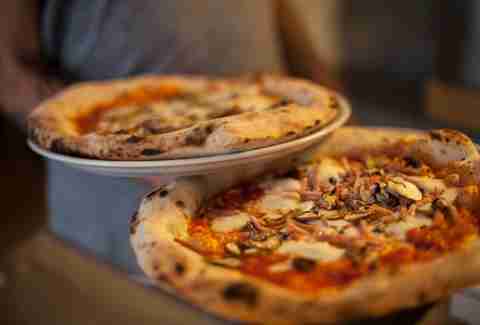 Today, it's delicious, and you'll find blistered, paper-thin crusts made from high-quality Italian & German ingredients, with high-powered wood-burning ovens to cook them in popping up all over town. Here are the very best. The sister restaurant to I Due Forni, Il Casolare has one undeniable advantage: it sits at one of the prettiest corners in Kreuzberg, right on the banks of the Landwehrkanal and across from the famed Admiralbrücke (a bridge over the canal where hipsters and students gather to drink beer in good weather and musicians come to serenade). Any of the thin-crust pizzas with thinly sliced grilled vegetables is sure to deliver on flavor, and the pasta dishes that sit alongside them on the menu are just as good. 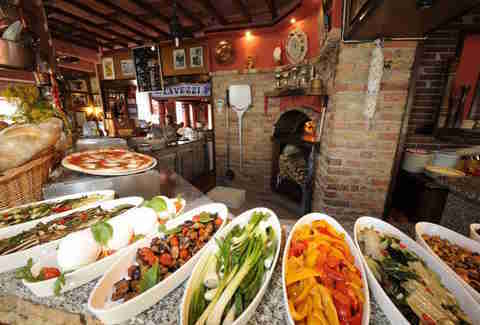 With its rustic interior, brick-lined, wood-burning oven, and large front patio, the long-running Masaniello is probably as close as you’ll get to a truly rustic Italian feel in Berlin. You can’t go wrong with your selection, but sometimes simplest is best, especially when the restaurant happens to be in possession of the “Guaranteed Traditional Specialty” certificate from the Italian Ministry of Agriculture. Order a margherita to savor the pure, quality ingredients of a classic. 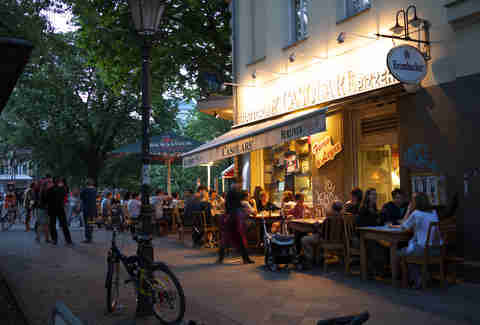 This cozy little place overlooking one of Prenzlauer Berg’s most charming squares is just out of the way enough to feel like a neighborhood secret, though ask any of the locals where to go for thin crusts and quality ingredients and they’re likely to point you here. Again, the classics are all on the menu, but for something special, look to the “Magiche” (magical) pizzas, which include toppings like grilled radicchio, pickled asparagus, marinated shrimp, or mint pesto. Tucked into a back courtyard off of Paul-Lincke-Ufer, ZOLA has only been open since January and is already something of a badly kept secret among the hipsters, students, and startup workers who frequent this part of Kreuzberg. 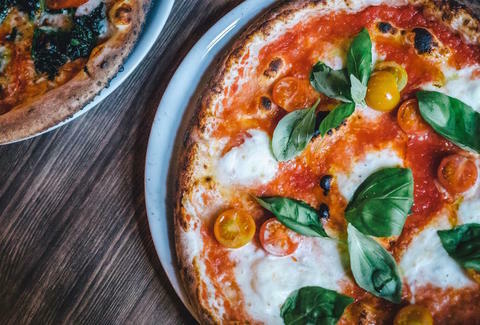 The décor is straightforward: a few simple wooden tables and a powerful wood-burning oven that reaches infernal temperatures to churn out pizzas -- as well as perfect rounds of sourdough bread -- in record time. The margherita has a paper-thin, crispy crust and generous amounts of mozz. Take it in a box to go and nab one of the tables out front overlooking the canal for excellent people-watching. The interior looks like something ‘50s Italy left behind, with a combination of tiled and wooden floors and half-worn-off, bold letter graphics adorning the walls. The staff is a bit bohemian, a bit punk rebel, and very Berlin. It’s easy to see why this quintessential Italian restaurant has been a favorite in Kreuzberg for years. For a special twist, order the Diavola, which is essentially a margherita graced with some spicy ‘nduja. 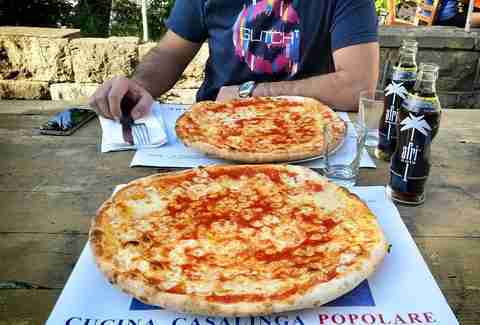 The new kid on the block, Standard Pizza opened a little over six months ago to rave reviews, especially from Italian expats. The chic, bright white space belies the amount of work that goes into these blistered, crackling creations, while a huge domed oven in the back serves as an altar, churning out pizzas in less than two minutes. The margherita is exceptional here, but Taste of Brandenburg is a lovely ode to locally sourced ingredients, w/ potato slices, wild boar sausage, and rosemary. Always packed, and perpetually hectic, this sprawling spot at the top of a strange little hill where Mitte meets Prenzlauer Berg has been a favorite for years. Its waiters have been known to be surly as hell, but the food is good enough that you won’t care. The unofficial favorite is the Pizza Incredibile, topped with Parmesan, buffalo mozzarella, walnuts, and two kinds of thin-cut dried sausage. Modeled after traditional establishments in that mountainous part of Italy the Italians call Alto Adige and the Germans call South Tyrol, Gasthaus Figl is a cross between a German guesthouse and an Italian pizzeria; that is to say, both cozy and raucous, with pizzas that are a bit heavier and heartier than your average Italian thin crust. The “Marinara Klassisch” pizza will satisfy those after familiarity, but the “Weisse” or white pizza has a wonderful savory mix of taleggio cheese, chard, cherry tomatoes, and pine nuts.